I like to think that I know a thing or two about Desert Strike. I fell in love with the game when I first played it on my brother's MegaDrive, and again when I played the Amiga version. Since then, it has been one of my all-time favourite games. It's actually one of the games that got me interested in games development. Being the reasonable and good-looking guy that I am, I decided to give it a second chance. Was it possible that I was wrong? Seriously; since when is Aypok wrong?! Since he dismissed the SMS port of Desert Strike, apparently. Desert Strike on the Master System plays almost exactly like the other versions of this game - which is undoubtedly a Good Thing™. You fly around, shoot stuff, get shot at, blow up buildings, rescue helpless soldiers who decided get lost in the desert - the usual. There are four areas/levels set somewhere in the Gulf, and you've been given the task of making your way through them and almost single-handedly stop the 'mad-man' from starting World War III! As with most evil geniuses, he has set up some formidable defences in an attempt to stop you. You're not going to let something like that stop you, are you? Hell no! Each of the four levels contains around half a dozen missions you must complete. Some of them need to be done in sequence - other can be done as you choose. Each mission is progressively harder and you're not done with that level until you've done *all* missions given to you. Fail one and you start again! Missions are usually along the lines of destroying key targets or picking up certain people. It's not all doom and gloom. It is for the bad guys, but not you - you have heavily armed attack helicopter at your disposal! With it comes three weapons, each more powerful than the last; the chain gun, the hydras and the hell-fire missiles. The more powerful the weapon, the less you have available to you - so you have to make them count. Like all vehicles, your chopper requires fuel. If you don't resupply, you'll fall out of the sky and scratch the paint-work so badly that you'll lose a life. Losing a life isn't too much of a problem - you just continue from where you died. So... Lots of enemies? Check. Crazy dude controlling the enemy who must be stopped? Check. Cool vehical with enough weaponry to decimate a country? Check. What more could you want? How about loads of little things that you find by exploring the large maps? See a random building or camp somewhere on the landscape? Blow it to hell and see what's inside! There may be treasure within; ammo creates, armour, fuel drums, etc. "How fun is it? ", I hear you muttering. Silence when I'm talking! It's great fun - if not a little easy. Despite the enemies turning and firing at you a more quickly than in the 16bit versions, it doesn't actually seem any harder. 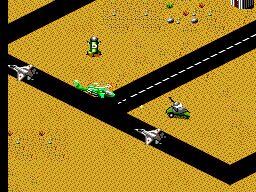 Infact, I'd go as far as saying it was the *easiest* version of Desert Strike I have ever played! Again, that could be because I know the game so well that I can get through most of the levels without needing the map. Talking of the map; everything is where it should be - give or take a few buildings. Even some of the smaller things are kept and put in their correct place on the map. There are a few minor things which are missing or have moved, but that's forgivable. This game will be very familiar to you if you've encountered other versions. It's not all good: The sea and trees aren't animated and the destroyed remains of buildings are somewhat lacking. Either a small hole will appear in the side (if it's a large building), or it'll just vanish (if it's a small building). For the most part, there is still a lot of detail in the graphics - despite being set in the desert, the screen is rarely dull. One *huge*, but thoroughly unsurprising, graphical let-down is the lack of the cool animations. Remember the brilliantly moody intro animation from the 16bit versions; the mad-man shooting at the ceiling, the caged hostage in front of him - then panning across the oil-refinery-filled landscape to reveal a scud launcher? It was great. It's also not in this version. 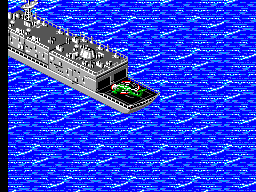 Nor is the bit on the last mission of level one, where your co-pilot runs down into the bunker to capture the other guy. And you can forget about the scene where the mad-man slaps his subordinate across the face. Such is life. Not all of the animations are gone, but the best ones have. The intro music is reasonably catchy, but it's nothing special. The ending of it reminds me of the ending of Top Gear's theme tune. You know the bit where it keeps going up and up? That bit. There's very little in the way of other music throughout the game and there's no in-game music at all. 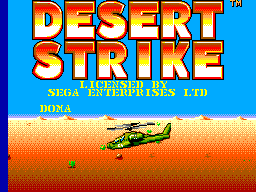 No version of Desert Strike (that I know of) has in-game music - if it did, it'd ruin it. There are plenty of sound effects to keep the silence at bay. You get to hear different music during the briefing, but it's not interesting. There's also a different tune for the animation between levels one and two. The music you hear after completing a level is just the intro music. This may sound silly (heh. 'Sound' silly. Get it? Sound section... Fine), but I was genuinely impressed by the rotor noise. It sounds really cool! The other sound effects - the gun fire, explosions, etc - are all fine. Nothing special, but not bad - they do the job for which they are intended. I do find the alarm sounds to be quite annoying... Then again, they *are* alarms. They're there to alarm you, not sound good. Do you love flying into buildings? No? Tough. The developers of this have improved upon the original's "let you fly into the buildings and spin around just when you really didn't want it to happen because there's a Rapier shooting at you" simulator, allowing you to crash into buildings even more easily! Thanks, guys! The controls are the biggest problem with the game, but that is not something which can be blamed on the developers. To play this game, you ideally need four buttons: map, chain-gun, hydras and hell-fires. The SMS has just three buttons (the pause button being the third). They could have done what the Amiga version sort of does (if you use a MegaDrive controller); button one fires the weapon, whilst button two cycles through the weapons. I'm pleased to say that I actually prefer the Master System's version: button one for the chain-gun, button two for the hydras - press button one and two together to get hell-fires. It completely negates the whole problem of trying to cycle to the right gun when you hit trouble. Desert Strike needs the map/status screen a lot - you'll soon learn this. The map shows where everything is, your targets, gives detailed info about enemies, friendlies, mission objects, as well as your general status. As you can see - it's pretty much essential. How does one access the map? The pause button, of course. It's logical enough - the MegaDrive and SNES use the Start button. Ah, but wait... The pause button is all the way over there, on the console. This is annoying - and get more annoying as time progresses. To exit the map, all you need to do is press button one or two - no need to press the pause button a second time. A great feature. Onto the actual piloting of your flying machine of death and coolness. To sum it up, it's too stiff - too rigid. It doesn't feel smooth enough. Although I don't know if the SMS could make it any smoother... It's not too bad, but it could be better - hardware allowing. In addition to that; I feel that the game plays too fast - especially after having played the original versions of this game. While it's annoying to start with, you do get used to it. I'd prefer it to be a little slower paced, but it doesn't detract from the game too much. The much-loved auto aim is still here. And it still aims at your own people and ammo crates! But it does make it much easier to shoot at enemy units. Most of the time, at least. Once you've done all the missions, you'd figure that there'd be no fun in going back and doing them all again. You'd be right. The thing is, this game has lots of little extras to occupy your time and weapons fire. There are many MIAs you can go and rescue. You could try saving *all* hostages, rather than the minimum needed to complete the mission. You could destroy every enemy and building on the map. It's up to you. There's a fair amount of space to explore over the four levels, but it won't keep you *that* interested. Unless you're nuts and love it for some slightly irrational reasons. Hello. I admit it! I was wrong. This game is not as bad as having to swallow an XBox whole, which was my original verdict. My original verdict included juggling burning copies of Running Battle whilst swallowing XBoxen, but I digress. This game is cool. If you've not played any form of this game before, try it. If you have played the MegaDrive, Amiga, DOS, or SNES version, you may find it to be a little disappointing at first - you'll certainly find it to be easier. Don't let that put you off, though. Unless you have a copy of this game for a 16bit system - in which case, play that. It's good, but doesn't beat the original 16bit versions. It's unfair to think it could. As an SMS game (ignoring 16bit versions), it really is well done and worth a go. All in all, it's a good port and is actually fun if you give it a chance. Now; go pretend you're Jack Bauer in a helicopter and kill some terrorists!